Where can you stream Sword Art Online Alternative: Gun Gale Online? On 2018-04-08 Animation/Action & Adventure TV Series Sword Art Online Alternative: Gun Gale Online first aired on GTV. 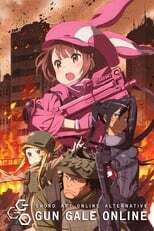 Written and created by Masayuki Sakoi & Yousuke Kuroda, and produced by Studio 3Hz, Sword Art Online Alternative: Gun Gale Online has ended and last broadcasted on 2018-06-30.